Looking for a healthy lunch that packs a protein-filled punch? Check out this low FODMAP quinoa and tuna salad. 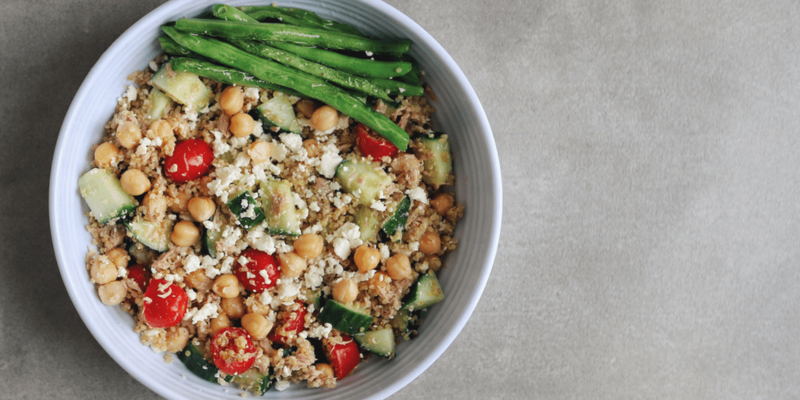 With 19.8 g of protein per serving, this quinoa salad is a great option for school or work. It will keep you filled up and ready to conquer the rest of your day. While I normally avoid seafood like the plague, I really enjoy this recipe. The texture of the quinoa and the acidity of the dressing disguise the tuna really well. This means I get the nutritional benefits of eating stealthy fishies without a lot of fuss. If you’re a picky eater like me or you’re feeding a little FODMAPer who isn’t sold on seafood, you should definitely give this recipe a try. Think this low FODMAP quinoa and tuna salad sounds great, but you don’t have time to try it now? Don’t worry. You can PIN THIS POST for later. 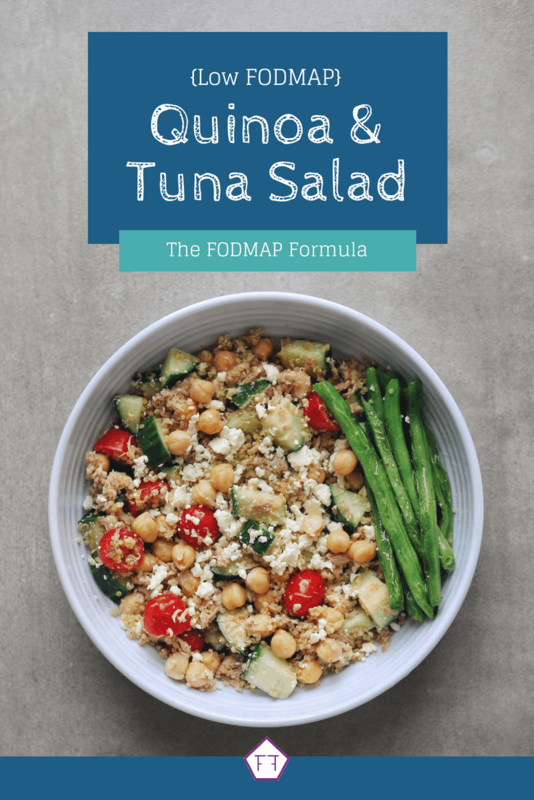 This low FODMAP quinoa and tuna salad is an easy way to feed your brain on the go. Check out the notes below for tips on keeping this recipe FODMAP friendly. First up is red wine vinegar. According to Monash University, red wine vinegar is safe in servings of 2 tbsp. This recipe uses 2 tsp in total, which is well within the recommended range. Next up, Dijon mustard. The Monash app says Dijon mustard is safe in servings of 1 tbsp per sitting. We use 1 tsp of Dijon total which is within the recommended serving size. Remember to check the label of your Dijon mustard for sneaky high FODMAP ingredients to keep this recipe FODMAP friendly. This recipe also uses cooked quinoa. According to the Monash app, quinoa is low FODMAP in servings of 1 cup per sitting. Monash doesn’t give a maximum serving, but this recipe uses 1 cup of quinoa total. So you’ll fall well within the recommended range. Fun fact, you can make quinoa in your rice cooker! We’ll also be using canned chickpeas. Monash recently tested chickpeas and determined canned chickpeas are safe in servings of 1/4 cup per sitting. Servings of 1/2 a cup or more are high in the FODMAP galactan (GOS), so make sure you measure carefully. According to Monash, canned chickpeas are lower in FODMAPs because FODMAP molecules are water-soluble. That means some of the FODMAP molecules leach out into the packing water and lower the total FODMAP content of the beans. You can read more about FODMAP solubility here. In case you’re wondering, sprouting your chickpeas does not lower the FODMAP content. In fact, according to this study by Monash University, sprouting chickpeas actually increases the FODMAP content. So stick to the canned variety until you finish your re-challenges. This recipe also uses feta cheese. According to the Monash app, feta cheese is safe in servings of 1/2 a cup (crumbled). We’re using 2 tbsp total, so you’ll be well within the recommended range. The last ingredient you need to consider is cherry tomatoes. According to the Monash app, cherry tomatoes are safe in servings of 4 cherries. Servings of 13 cherries or more are high in the FODMAP fructan. This recipe uses 12 cherry tomatoes which works out to 4 cherries per serving. If you’re having a double portion, make sure to adjust the number of cherry tomatoes so you stay within the recommended range. 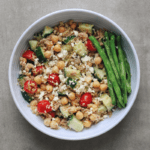 Want to try this low FODMAP quinoa and tuna salad? Don’t forget to PIN THIS RECIPE for later. Looking for a healthy, protein-packed recipe? Check out this low FODMAP quinoa and tuna salad. With 19.8 g of protein per serving, you'll have lots of fuel to get you through the day. Combine olive oil, red wine vinegar, lemon juice, mustard, salt, and pepper in a medium-sized mixing bowl. Then add quinoa, chickpeas, cucumber, cherry tomatoes, feta, and tuna and stir gently to coat in dressing. This low FODMAP quinoa and tuna salad will keep you fueled throughout your busy day. If you like this recipe, make sure to sign up for my mailing list below. You’ll get new low FODMAP recipes and articles delivered right to your inbox. Want to know what else is happening in The FODMAP Formula kitchen? Follow me on Instagram for bonus recipes and a sneak peek at my latest projects. Together we’ll get the Low FODMAP Diet down to a science!